It seems like only a few years ago that people would run to the street vendors in New York City for an authentic New York hot dog, thinking that was the best they could do with such little time to spare for lunch. In those days, a meal from a to-go cart may have entailed some sort of greasy kabob made of who knows what, or a pretzel that had spent a little too much time in the sun. Nowadays, however, these food carts are becoming healthier and the quality of the food itself is becoming better as well. Along with the growth of the food cart in this country came the rise of the food truck as a means to a quick meal on the go. Food trucks aren’t new. But, what is new is the number of them, and quality of the food that is served from them. Today, there are dozens of food trucks on the streets of New York City, with cuisine ranging from ice cream to falafels, and from pizza to tacos. There are sandwich trucks, burger trucks and even steak trucks! The best way to break into this business, much like any other, is to tackle the untapped markets. If you are expecting to see much growth, it’s probably not a great idea to start in a big city like New York, where food trucks are a dime a dozen. That is, unless you can offer something that none of the others can (like a particular type of cuisine that only you make). But the best way to break out is to go into a market where these trucks aren’t as common. That way, everyone will know your truck, and they will become your loyal followers. And speaking of followers, it has been said that the most successful food trucks are those that are up to date with the social networks. That way, you can Tweet “I will be at the intersection of X and Y Street at 12:30 today”, and your customers will know to meet you there. A shining example of a social media savvy food truck owner is Chef John Schulze, whose Cajun-inspired dishes are causing quite a stir in Wadsworth, Ohio. 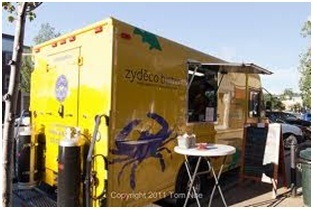 Schulze’s Zydeco Bistro not only serves upscale, quality cuisine, but also has its own website, Facebook, Twitter, and Linkedin pages, so that customers can get the inside scoop on menu changes, pictures, events, and the locations of the food truck itself. We had a chance to interview this chef, and will be posting it very soon, so be sure to check back for that article! *Also, be sure to Like us on Facebook and Follow our Twitter Feed for exclusive discounts and other special offers!